Irish and Celtic music have certainly enjoyed a revival in recent years, and the influence is being felt in everything from pop and rock performers, to pennywhistles being added to new age music. While some of the long-time performers in traditional music such as the Chieftains have enjoyed a good deal of popularity in the US, there is a younger generation of Celtic groups who are bringing new life into the style by going beyond the strictly traditional. Arguably the best of the younger Celtic bands is Solas, who have just released their fourth CD in as many years, called The Hour Before Dawn. Solas is a genuinely Irish-American band with members from both sides of the Atlantic. It was founded by Pennsylvania-born Seamus Egan, who spent a few of his formative years in Ireland, where he developed a passion for traditional Irish music. By his late teens, he had won major instrumental awards at the prestigious All-Ireland music competition, winning on four different instruments, which no one had done before. After a couple of solo albums, and an association with the band Chanting House, Egan launched Solas in 1996 with other young, like-minded musical virtuosos, including fiddler Winifred Horan, a New York native who studied at the New England Conservatory of Music but also won competitions in Ireland, and Irish natives John Doyle and John Williams. Solas' eponymous debut album received almost universal acclaim, with its combination of astonishing musicianship and a great sense of spirit. The group achieved a wonderful balance between respect for the traditional and musical adventurousness. In 1997, accordionist Mick McAuley replaced Williams but Solas only got better over the course of their next two CDs. But before the making of The Hour Before Dawn, their original vocalist Karan Casey departed to pursue a solo career. And although a fair portion of Solas' music is instrumental, Ms. Casey was an important part of the group's sound. Last year, Solas recruited Dierdre Scanlan, also an Irish native, to replace Ms. Casey. Although Ms. Scanlan nicely fits into the Solas sound, her style is a bit more like the English folk singers than her predecessor. In fact, I find Ms. Scanlan frequently reminiscent of the Pentangle's Jacquie McShee. On each successive record, Solas has broadened their sound some, doing for instance, a Woody Guthrie song in Celtic style. The Hour Before Dawn also attempts to expand the group's horizons, with some results more being successful than others. It also seems that there was conscious attempt to aim for a somewhat wider audience, by including a pop song recorded by Sarah McLachlan, and incorporating drums and bass on several of the tracks. While I felt that a couple of the tracks seemed musically "dumbed down" compared to their past work, Solas also extends their eclecticism to adding instruments like tabla, and including more songs sung in Gaelic. But the musicianship is always first-rate. On their new fourth release The Hour Before Dawn, Solas underscores their position as one of the finest contemporary Irish and Celtic groups in the world. Their eclectic approach and amazing musicianship, combined with their respect for the traditions, wins accolades from listeners and critics everywhere, appealing both to those who like their music on the traditional side, and those who are intrigued by the mixing of Celtic influences with other genres. Their new singer Dierdre Scanlan is a worthy addition to the group, providing a somewhat different approach than her predecessor, with Ms. Scanlan taking more of an English folk approach. But because of the group's apparent attempts to broaden their audience to pop fans, by including for example the Sarah McLachlan song, I don't think that this stands as their best album. The pop and new age tracks seem like distractions. That push toward pop audiences also extends to the recorded sound, with some of the tracks having an excessively compressed in-your-face sound for such mostly acoustic music, while other tracks have an admirable sonic treatment. The engineer for this Philadelphia-made recording was John Anthony, who also played percussion on the CD, and performed similar duties on the group's last album. The state of the art for Celtic music continues to rise. 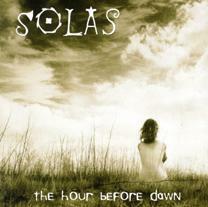 Solas is one of the genre's bright lights, and although The Hour before Dawn may not be their finest recording overall, the group nevertheless continue to take the music to new heights.